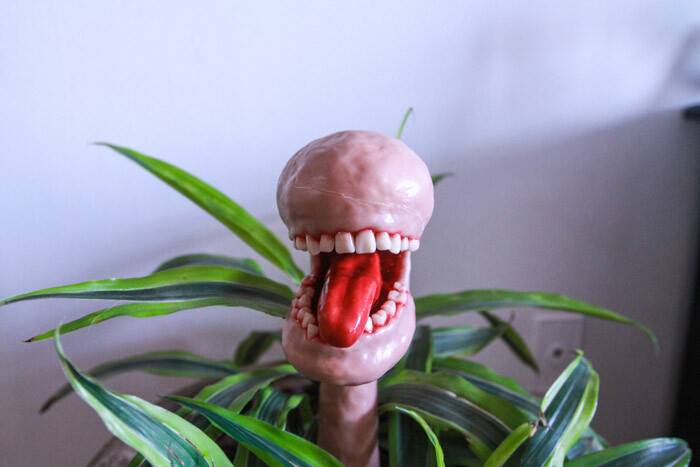 I’m a big fan of Little Shop of Horrors, and was inspired to make some sort of man eating plant for a new Halloween Craft. 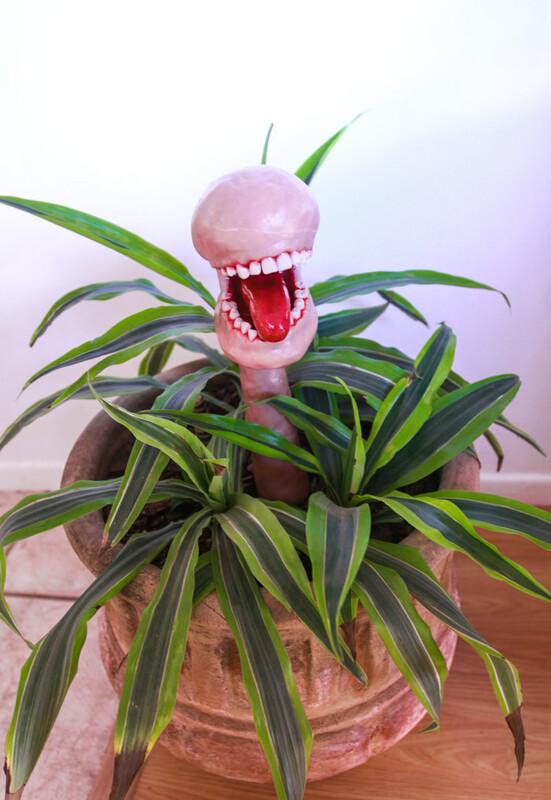 Plus, we had this perfect little jungle-y planter in our house that was just begging for some sort of carnivorous flower head. 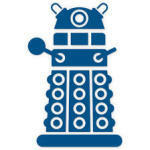 This was a trial and error kinda thing, since I wasn’t exactly sure of the best way to do this. I’m going to omit some of the steps I took that were unnecessary and wasted time. Here we go! 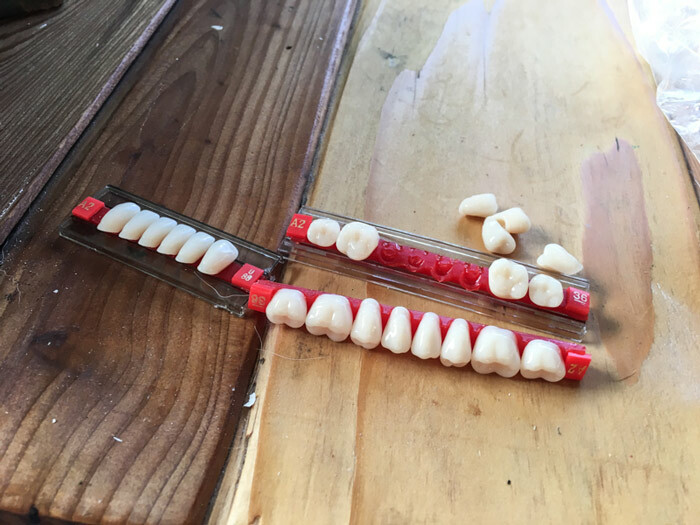 Human teeth (on Amazon here for $8. Note: They take a few weeks to arrive). 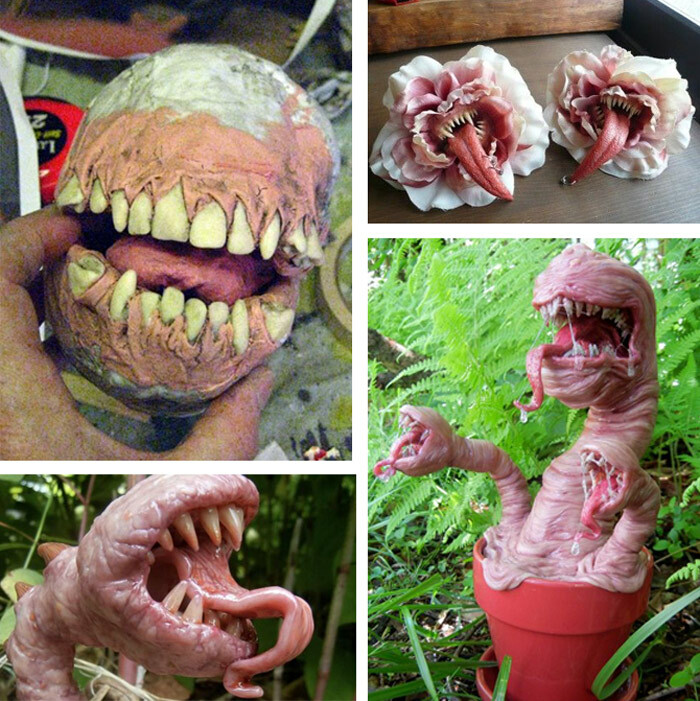 I loved the weird human teeth in the first image, and the shiny gross texture of the bottom two. Time to begin! Get a couple of skewer sticks, then crumple paper up around it. 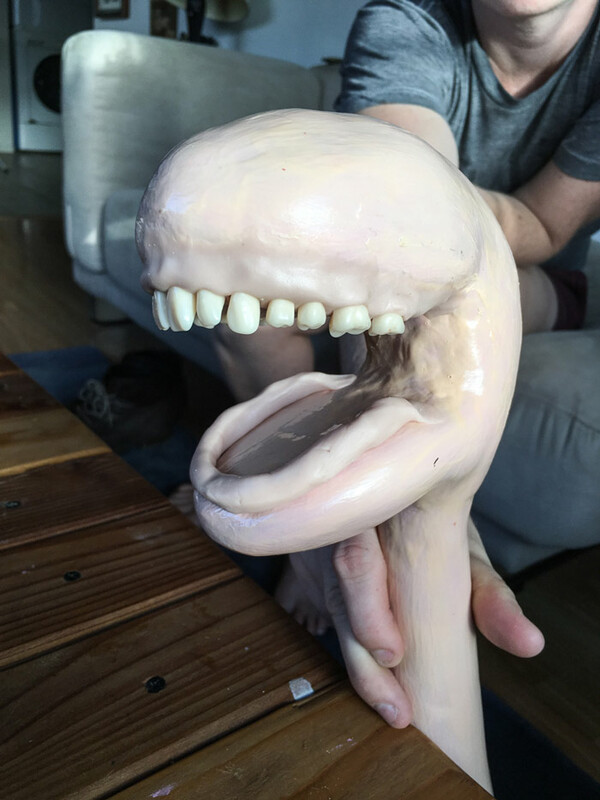 Crumple a lot at the top for the head, and make a puppet-like mouth shape. Tape all the paper up as you go along. 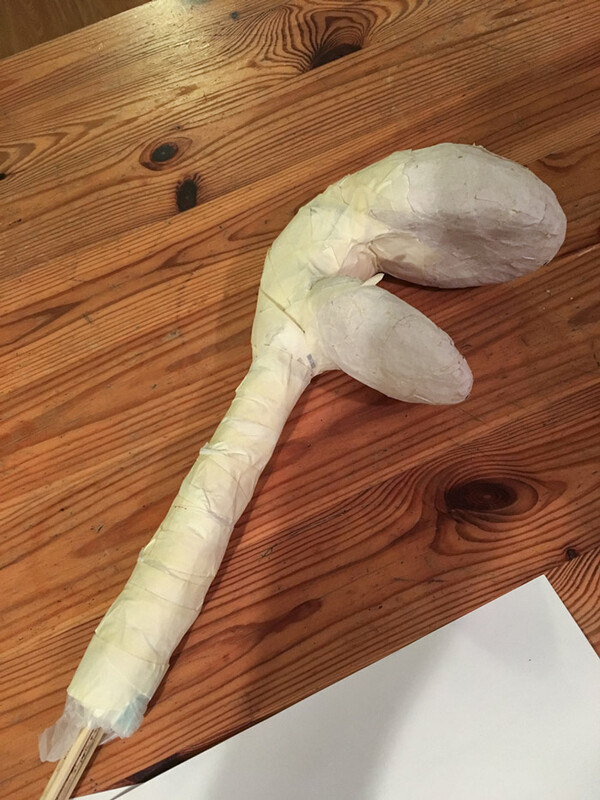 Then make some paste out of flour and water, and paper mache the outside for a few layers. Let it dry (either in the oven on warm for an hour, or overnight). 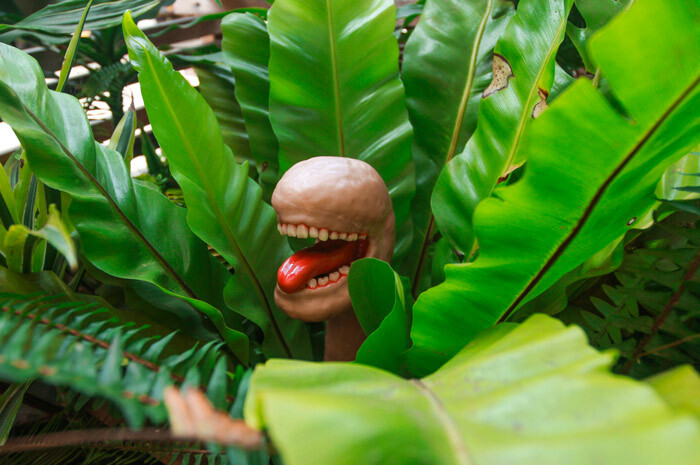 Once the paper mache was dry, I covered it in flesh-colored sculpey. 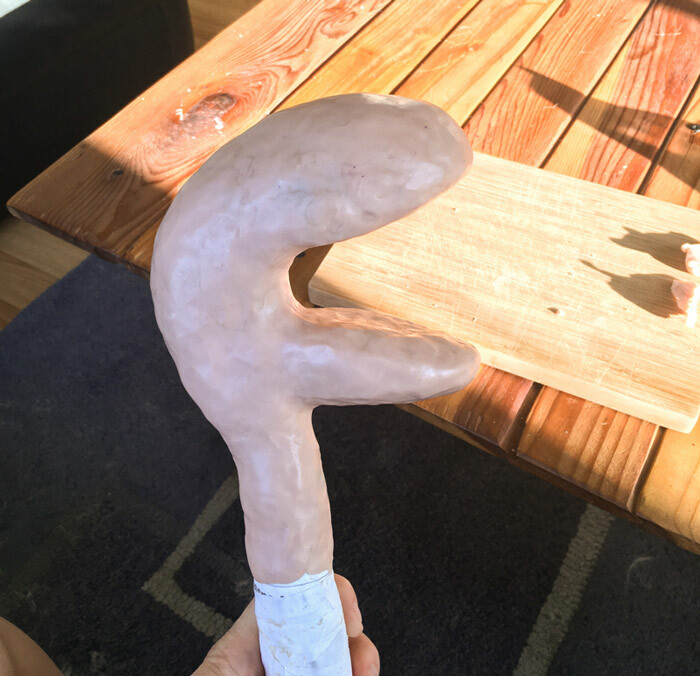 I theoretically could have made the entire thing from sculpey and avoided paper mache all together, but it would have been really heavy and more expensive. 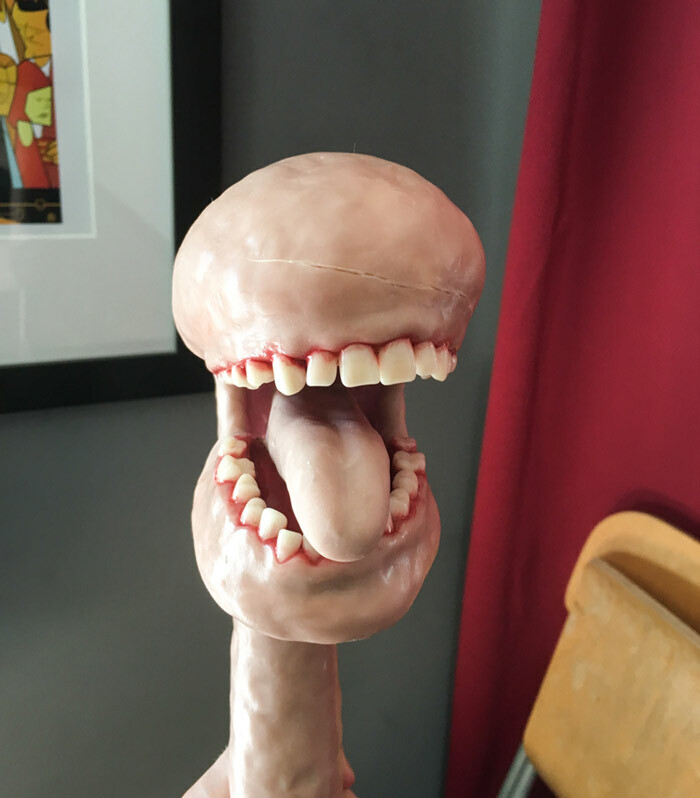 With a bit more sculpey, add gums and push the human teeth (purchased here) into them. Then, bake the sculpey according to the instructions on the package. 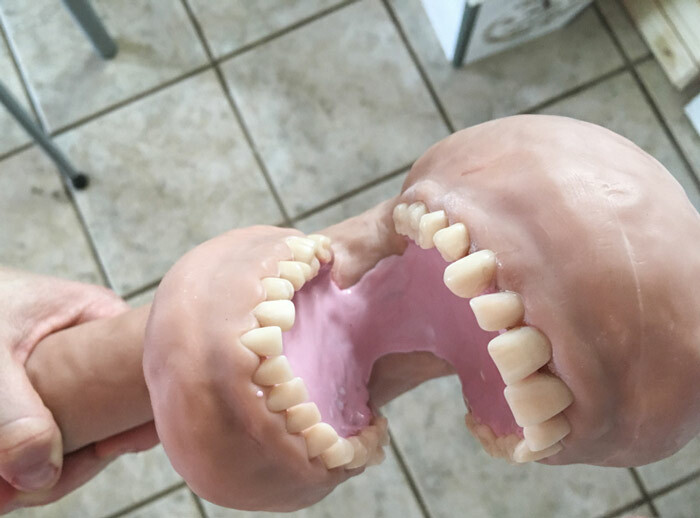 Afterwards, you can use a little bit of super glue on the inside of the mouth to make sure the teeth stay in (optional). Mixed a bit of high-gloss mod podge with some dark red paint. It will look pink, but don’t worry. It dries red. 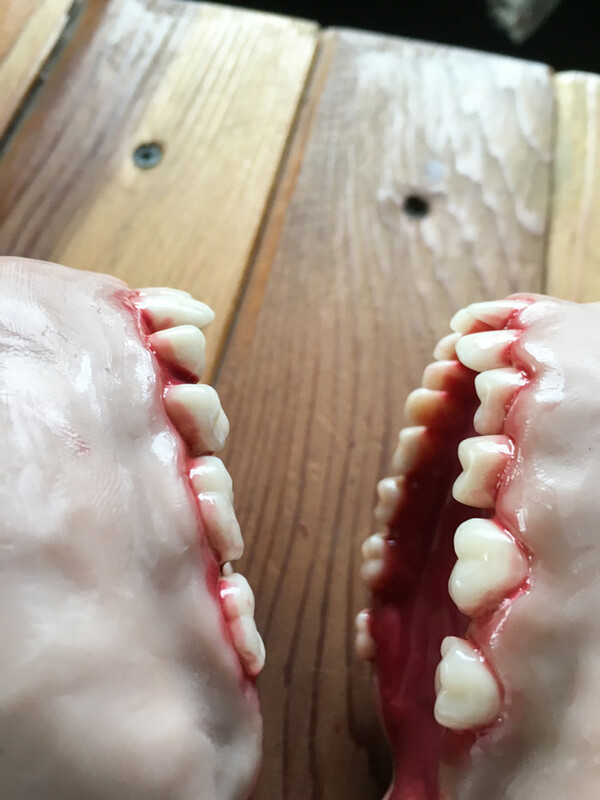 Then coat the inside of the mouth, and paint a little bit on the teeth around the bottom. Grossssss. 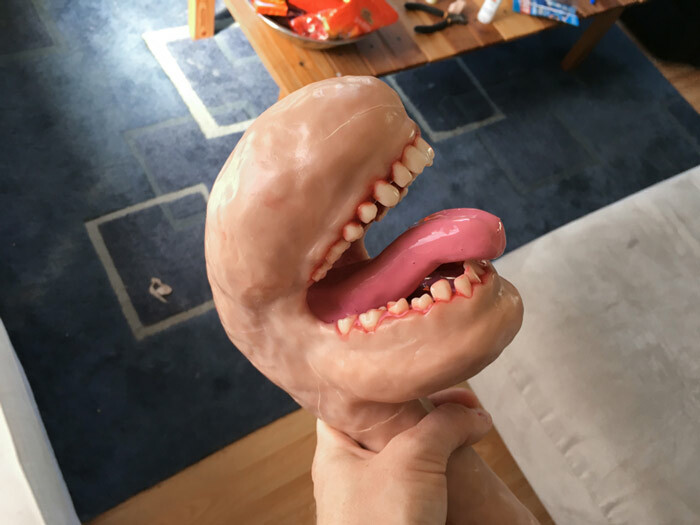 Use more sculpey to make a silly tongue. 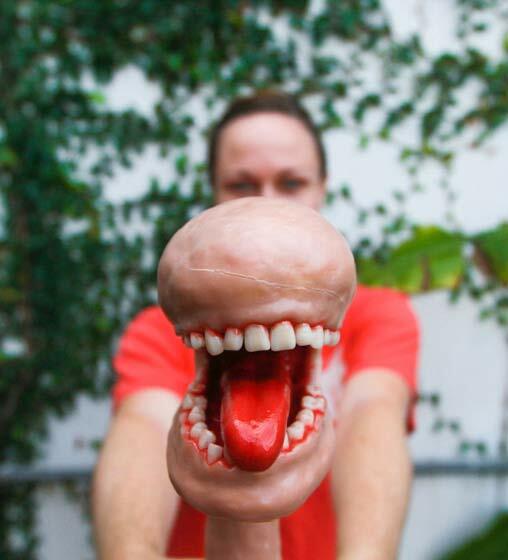 Then attach it to the mouth (using sculpey or glue). 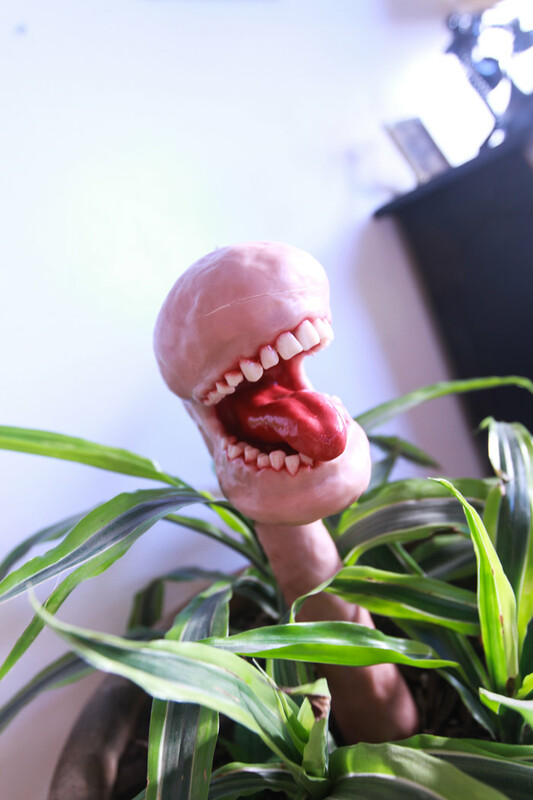 Use more of the red paint/mod podge mixture to coat the tongue and let it dry. Just discovered this! AWESOME JOB!